• Appropriate for lyrical, modern, contemporary, and teaching. • Soft, durable leather upper. • Patented, two-piece, split-sole design with minimalist instep provides notable arch exposure. • Contoured suede forefoot patch provides traction. • 3/4" Cuban EVA heel. 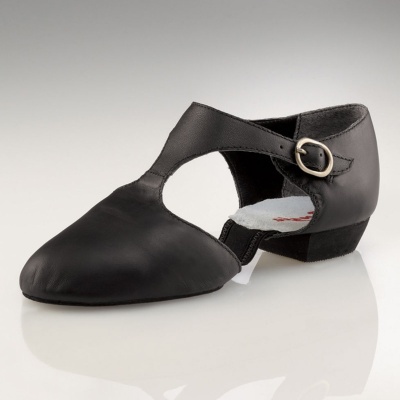 • Non-slip heel counter offers outstanding support. • Split sole suede socklining provides comfort, traction, and moisture absorbency. Available in Adult sizes 3-3.5. Begin with street shoe size. 1. Is there rubber or leather on the sole of this shoe? Yes, these shoes have a leather sole and a rubber heel.